You bought your ticket no problem and you think you’re set. You head over to the turnstile and click your card, but nothing’s happening! The more you click, the angrier you get. But before you transform into the Hulk and start breaking stuff, back away and see if there’s an arrow. These arrows indicate if that particular gate is for entry. 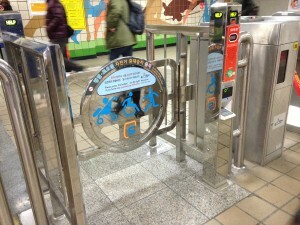 To make foot traffic flow smoother, Seoul subways designate half the gates for entry and the other half for exits. And you’re probably just at an exit gate. So put your shirt back on and move on over to a turnstile with an arrow, Bruce Banner. If you’re traveling to Korea with one of those big daddy travel suitcases, you might have trouble getting through the turnstiles. Although many of the newer Seoul subway stations have entry points without turnstiles, many of the non-upgraded stations will still have them. And that ain’t good for big papi. A lot of times the handles get stuck in the turnstiles, or sometimes the suitcase just doesn’t fit. So instead of lifting your suitcase over your head like a pro wrestler looking to bodyslam some luggage, do the easy thing and head over to the wheelchair access gate. All subways are equipped with this gate to provide access to the disabled as well as travelers that love to pack their entire wardrobe. Just “click” your T-money cardon the sensor and be on your way! Tip 1: If you have a lot of luggage, use the elevators. 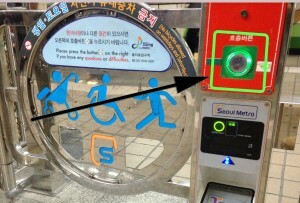 Nearly all Seoul subways stations can be accessed by elevator. Tip 2: Gates can be used for strollers. Sometimes Seoul travelers occasionally get on the wrong side and need to cross to the other. This isn’t an issue if you’re at a one-platform subway station that has trains going in both directions. But if you’ve made this mistake at a station that requires you to go up to the turnstiles and cross to the other side, you won’t want to use your T-money card to get out (you’ll be paying an extra fare). Instead, head over to the wheelchair access gate (see #2) and press the button and wait till the gate opens (sometimes there will be no sound). Then head over to the wheelchair gate on the other side. If they see you they’ll most likely have it readily open for you. If they don’t see you, you can press the button again. Tip: The speakers let you talk to the staff members to explain your mistake, but many times the staff won’t even ask and just let you through. 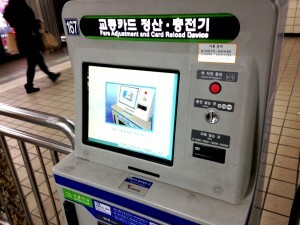 Seoul subway fares are determined by the length of your ride. But if you like being a spontaneous traveler and decide mid-ride that you’re going to go a little farther than your original destination, your fare might increase. And if you don’t have the right amount charged on your card, the gates will refuse to open. Instead of being criminal of the year and jumping over the turnstiles, be a bit more civilized and pay the extra few hundred won. 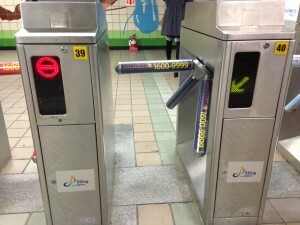 All subway entry points will have machines to recharge your funds. Here you can pay whatever extra you need and be on your way. Tip: This tip also applies for when you run out of funds on your T-money card. 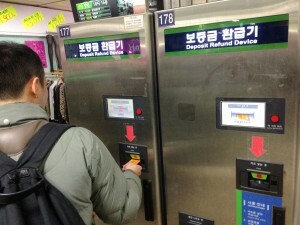 This tip we covered for Seoul subway beginners, but if you’re going to buy your tickets at the station, you will have to purchase a single use card. And the Seoul subway staffers like to get those cards back to sacrifice to the subway gods (or maybe just to recycle them). To ensure that they’ll be getting their sacrificial lambs back, they ask subway riders to put a 500 won deposit for each ride. When you get off at your station, you of course get that money back at a refund machine. This is a super simple tip that too many tourists gloss over. 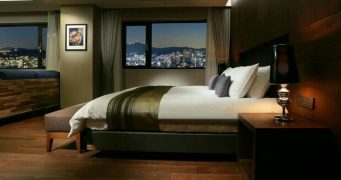 So remember to get your 500 won back at the end of your trip, which’ll keep your wallet and the subway gods happy. Tip: To avoid this hassle, just get a T-money card. Trust us. It’s worth it. How to Ride the Seoul Subway Like a Local? 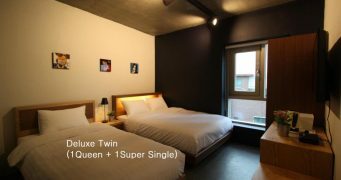 I learnt #1 and 2 from my experience, when I was in Seoul last October. #3 – I just asked a staff and they let me go through these gates to the other side, they are always so supportive. #5 – I made such mistake and throw away used cards but subway gods didn’t punish us, kamsahamnida. So you see your tips hit the right nail. Thank you for your tips! 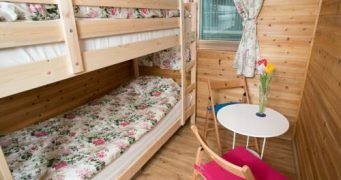 i’d appreciate if you could post about korean indoor/outdoor games someday too. Koreans are known as huge gamers. What are the most popular games they like playing when come together with friends? Also, I would mention that on the subway that there are seats for only Older/Handicap people. I think many foreigners don’t know about this and would sit there. I’d like to add to this list that it’s easy for people to confuse Sinchon and Sincheon. Watch out for that mistake! They’re not even close to each other. Refund the unused money on a one time use card?? 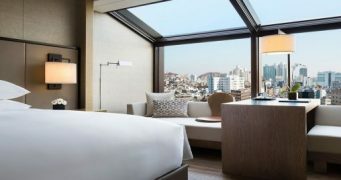 That’s why I love Korea! Customer care at its best!